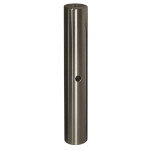 25.4mm diameter, 150mm length stainless steel post. These stainless steel posts are tapped with M6 threads on both sides. The post also has a 6.3mm hole through the middle, and a relief cut on both ends to ensure proper seating.